EAM division at KIIT is virtually the corporate unit of the University. Its primary objective is to provide the students with knowledge & experience in ERP, CRM, SRM, SCM & PLM, enable students & faculty to interface with Industries to work in areas of mutual interest and carry forward training & consulting work. In essence the initiative was started two years before when Prof Beura, Head of the division joined the University and was given all kind of support from the University Management to create a niche for the varsity in Academia-Industry collaboration space. The initiative started with the alliance with SAP UA for providing ERP education to its students. 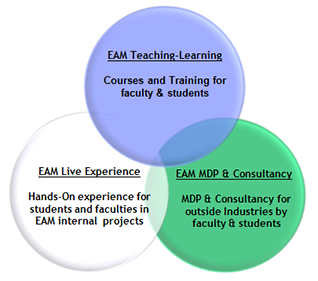 The division EAM operates with three pronged strategies and offers various courses as part of course curriculum, part of Summer Training, Internship and as additional modules for the University students. *EAM division at KIIT is implementing SAP solutions at the University. The current scope of SAP project includes: FI, MM, HCM, SLCM, BO,PI areas for 16 Schools, 4,000 Staff members and 18,000 Students.